Sometime you have to face WiFi connectivity problem on your Android phone. If you face this type of connectivity problem on your device then you are not able to communicate with Internet. Most of the users want to know what to do when WiFi does not work properly. In this article we have to discuss reasons and solution what to do when WiFi does not work properly. Most of the person have to use WiFi connection at his home or office. With the help of WiFi connection you can easily connect your device with Internet. But sometime lot of users complain that his WiFi does not work properly or not getting required browsing speed. 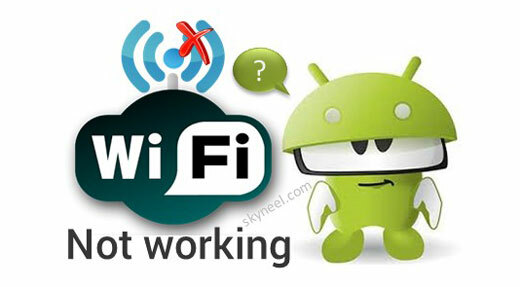 Let’s start few important reasons and solutions due to which what to do when WiFi does not work properly. Sometime we have to forgot the WiFi password due to which you are not able to connect with WiFi. You can easily recover forgot WiFi password without any extra effort. If your WiFi does not work properly then you must have to deactivate and reactivate the network connection. You can also turn off your router. If your problem remain then you have to turn on Airplane mode your Android phone for few seconds. You have to turn on and again turn off Airplane mode and check the connection again. If your WiFi connection does not working properly then you have to restarting your device in the safe mode. If you have Android Kitkat or Lollipop problem then you have to boot your phone into safe mode. We have already discuss how to boot Android phone into safe mode in our previous article. Most of the person does not like to keep WiFi on during the sleep. This is another reason due to which WiFi does not working. In that situation you have turn on this option on your Android phone. If you want to keep WiFi on during the sleep then you have to take few simple steps which is given below. Step 2: Tap on the “WiFi” option on your Android phone. Step 3: Tap on the three dot which is located on top right corner on WiFi window. Tap on the “Advanced” option and tap on the “Keep WiFi on during sleep option“. Step 4: Tap on the “Always” option in the Advanced WiFi window. If you are not able to get proper browsing speed after connecting your phone with WiFi, you have to check the WiFi speed properly. Most of the time there are a lot of person share your WiFi due to which your browsing speed too slow. You have to remove all other mac address from your WiFi connection then you will get proper speed of internet. If you will not get proper browsing speed and want to check WiFi speed then you have to download and install “Speedtest.net” app. The Speedtest.net app is free to use app which is available on the Google Play Store. With the help of Speedtest.net app you can easily discover your download, upload speed. You can easily troubleshoot or verify the speed, check real time graphs which show connection consistency and many more. Sometime when you does not fill correct password to connect your device with router or network then system generate authentication failed error message. This issue is generated due to fill wrong password. If your password is wrong then it fail to authenticate and shows an error message on your screen. It is one of the most important reason when WiFi does not work properly. So, during connecting your device with your router or WiFi you have to fill correct WiFi password. There are few another common reasons due to which your WiFi does not work properly. Remove the mac address of your phone from the WiFi access list. Disable the WiFi connection from the router. Turnoff the switch of your WiFi router. Cabel does not connect properly with the router. These are the most common reasons due to which your WiFi does not work properly. If you have this type of problem then you have to check all the given reasons and solution to connect with WiFi network properly. If you have any suggestion regarding this article please write us in the comment box. Thanks to all.